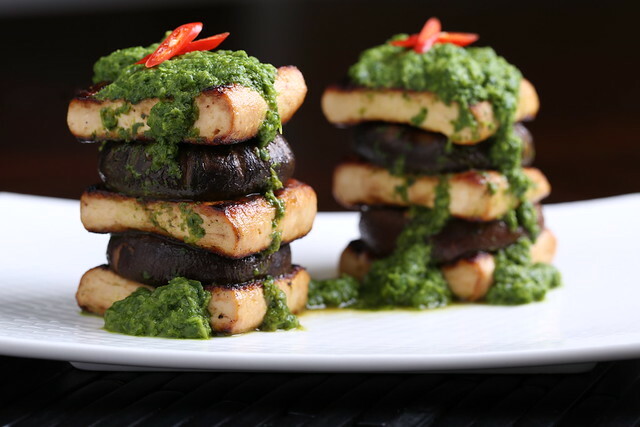 To properly prepare this tofu, you’ll need to get every drop of moisture out of the tofu before placing it into the marinade by thoroughly pressing it. I always press tofu using this method, and would strongly recommend it for this dish as well as any other marinated tofu dish. This method always produces tofu that is succulent, full of flavor and comes out of the pan beautifully textured and seared. Combine all of the marinade ingredients in a large and shallow glass pyrex. Cut each of the slabs in half to create 8 squares, then place the tofu into the marinade. Cover and refrigerate overnight. Flip the tofu at some point in case the tofu is not totally submerged in the marinade. When you are ready to make the dish, place 4 TB of the marinade into a skillet over medium-low heat. Add in the ginger and saute for about a minute. Add in the bok choy and salt, and allow to soften for about 5 minutes, stirring occasionally. Add to a blender and allow to cool while you prepare your tofu. In the same pan, add in about 3 TB of the marinade, then add in the tofu. Increase the heat to medium. Allow to saute for about 5 minutes. Check the bottom of the tofu—if it is nicely browned, flip it over, then allow to saute for an additional 5 minutes. Check it occasionally to ensure it does not burn. Transfer to tofu to a separate plate to slightly cool. Add in 3 TB of the marinade to the pan. Place the shiitake caps into the pan, then cover. Allow to steam for 3-5 minutes, then remove them from the heat. By now, your puree should be cooled enough to safely puree it. Puree until smooth, adding a little bit more of the marinade if needed. 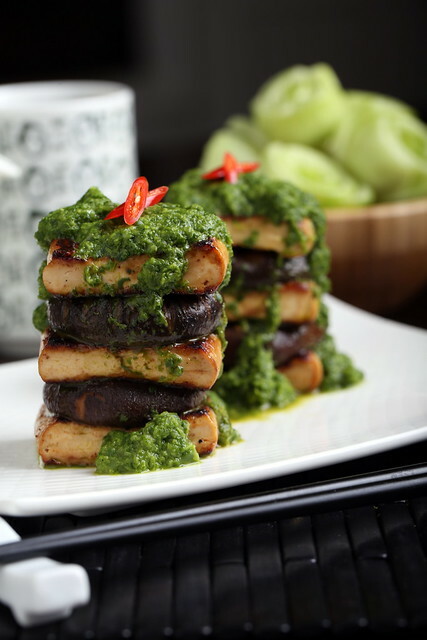 To serve, stack the tofu and shiitake, then drizzle with the bok choy puree. *This dish also tastes nice as a stir fry. Just prepare everything as described above, then toss the puree with some soba noodles and serve. Don’t toss out the bok choy stems when you are done—reserve and freeze them for making vegetable stock later. what a work of art. you are so inspiring! I am not a Vegan, and I came upon your blog by accident I think from Tastespotting. But I have to say your photos (husband's photos) are incredible. And if I were a vegan I would get out the pots and pans and start cooking. Heck, I may do it anyway. Your recipes really do look amazing – absolutely amazing! A beautiful blog! Gorgeous! I have a load of bok choy coming out of the garden now. I need to find time to make this. Your food and pics always inspire me! Hello, Erin! I have been meaning to make this recipe for a while. Had a wonderful experience with it last night. Very delicious! I love the bright green freshness of the ginger bok-choy. As always, the presentation and art of your dishes draws me in every time and the flavor never disappoints. For me, I blended the marinade ingredients raw and then simmered for 5 min or so. I also added in a handful of fresh cilantro which seemed to compliment the ginger and bok-choy. Delicious as always! Glad you enjoyed — cilantro sounds perfect here! Thanks for trying it out, Leila!